According to new plans located by BGWFans, the above open area within Busch Gardens Williamsburg will look very different in 2020. The space, located adjacent to the Italy themed section of the park, has been rumored to be the location of a big new roller coaster for almost two years now. As you can see, the site was able to locate some blueprints that reveal plans for footings that give a general layout of the new coaster. The good news is that it looks to match up to the images that were leaked last fall. 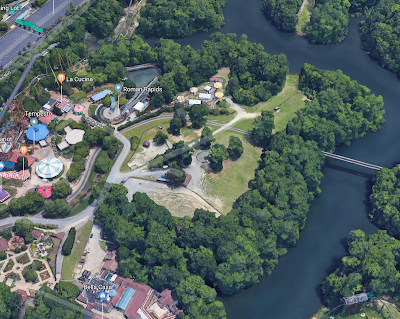 The ride appears to use a launch to perform an initial swoop down toward the Rhine River in what would be the bottom right of the aerial up top. The ride will have a second launch after that which will make use of switch-track to allows trains to be launched up a high point, then go backwards up a spike, then full blast launch one more time and up a top hat or similar element. Then comes what looks like a massive drop down toward the river which could involve some serious elevation change and speed. The leaked images show a big fan turn afterward to burn off some of that speed, and BGWFans' layout shows some more twists and turns on the way back to the station. Obviously this is all very preliminary but it's very encouraging, and looks like a thrilling attraction is on the way!